The Chelsea Pensioners' Appeal aims to raise £35m to build a new infirmary at the Royal Hospital Chelsea, home to around 300 former army servicemen. The existing PR campaign had raised awareness of the appeal but the media and public still tended to associate the pensioners with events such as ­Remembrance Day. 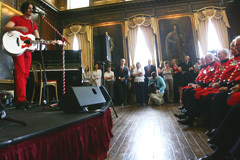 US band The White Stripes, in the UK to headline the Wireless Festival in Hyde Park and promote new album Icky Thump, donated profits from a gig at the Rivoli Ballroom in Brockley to the appeal fund. The band also played a gig for the pensioners at their RHC home. To promote the Chelsea Pensioners’ Appeal to a wider audience. To boost sales of Icky Thump, the latest­ ­album by The White Stripes. Invitations were restricted to 30 influential journalists, who were notified the day before. News of the ­afternoon show was kept secret from the public. The PR teams coordinated a post-gig photo call and interviews with the band and a few of the pensioners. As well as a full page in The Independent, the event featured in The Sun, The Star, Daily Mail and Metro. Coverage in London included thee Evening Standard, London Lite and thelondonpaper. Broadcast coverage included ITV’s London Tonight, BBC London, and BFBS (British Forces Broadcasting Service). Music media coverage included NME, Q and MTV. Globally, it was picked up by CBS, The Washington Post and the International Herald Tribune. With press coverage biased towards a mainstream and youth audience, the Chelsea Pensioners’ Appeal reached a previously untapped market. The number of donor enquiries to the ­appeal website increased in the days after the event, and the evening show raised money for the charities involved. The following week, the band scored a second UK number-one album slot.